SWOON. THIS COULD BE THE START OF SOMETHING GREAT. And, we know you’re totally in love with your spouse! It’s just that sometimes they don’t fold the laundry like you usually do… or they leave their shoes out and you trip over them every time you walk in the door… or they have a habit of wanting to go out, when you really think that you probs have better things to be spending your money on. Being a newlywed is full of these situations and hard conversations. It happens. We get it. And that’s why we’re here. 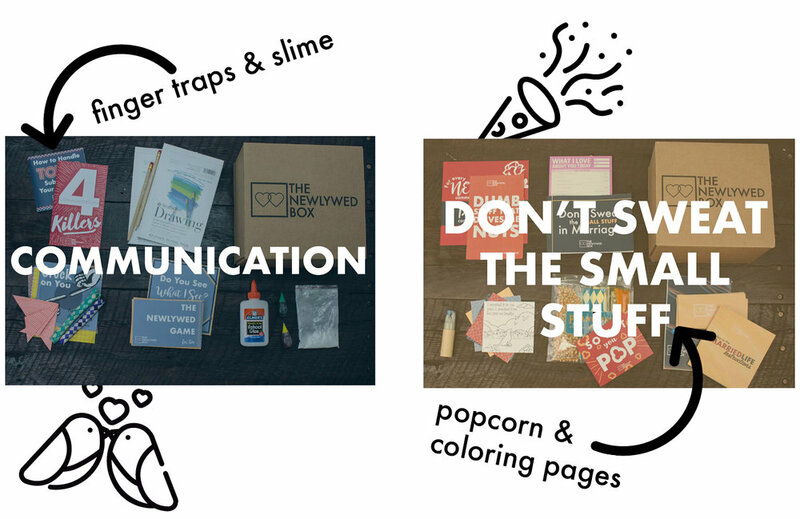 The NewlyWed Box is all about you as… well, a newlywed. Duh. We want you to have fun going over the bumps and through all the awkward moments you run into with your new spouse. JUST LOOK AT SOME OF THIS STUFF! It’s pretty awesome, right? Even more than that, it’s useful. This stuff will stick with you for the rest of your marriage if you let it! We believe that a healthy, happy, and fun marriage starts long before you hit the 50 year mark. In fact, it starts right now. That’s why we do our best to give you relevant, relatable, and reliable info so that you and your spouse can have the marriage of your dreams. SEE WHAT IS INSIDE THE NEWLYWED BOX! TAKE THE RISK. SEE WHAT HAPPENS WHEN YOU DO MARRIAGE DIFFERENTLY.